The Endangered Language Alliance, based in New York City, recently hosted an event to share the work they are doing with indigenous Mexican languages. Check out this recent NPR interview and learn more about the Nahuatl classes they are offering. Our Mother Tongues, a project created by filmmaker Anne Makepeace and Cultural Survival’s Program Manager for Endangered Languages, Jennifer Weston, is a great resource for learning about and celebrating endangered Native American language revitalization programs. The website also gives visitors a chance to actually hear Native speakers and send eCards with Native language audio greetings. 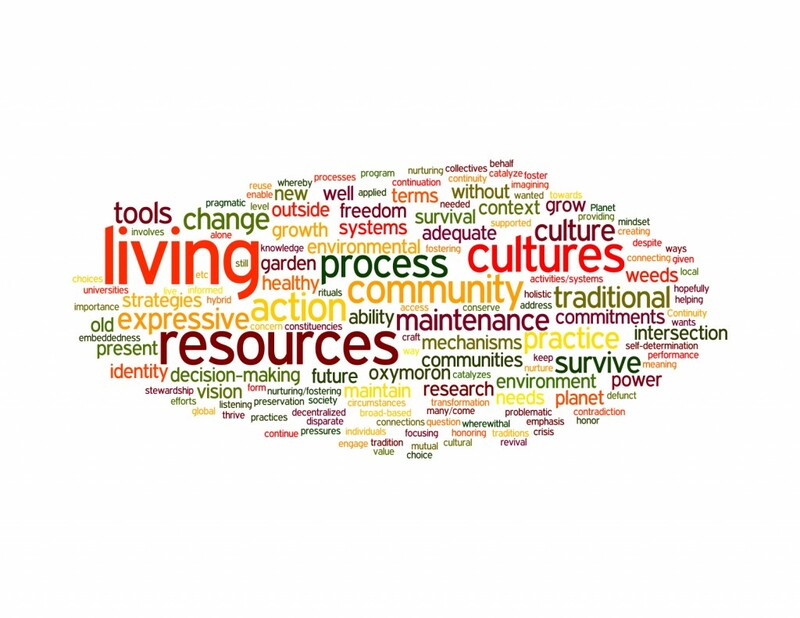 While investigating cultural sustainability initiatives, I have found that many include elements of environmental preservation. But what happens when environmental protection projects and policies interfere with cultural sustainability efforts? Does or should one be prioritized over the other? If so, how is the choice made? Is it possible to find a balance? And perhaps, most importantly, what are the consequences of these decisions? Interested in sustainable cultural tourism? …Or not convinced such a thing is possible? …Then you may be interested in this upcoming free Sustainable Cultural Tourism webinar, hosted by Dr. Susan Guyette. Dr. Guyette is the Cultural Tourism Advisor for Sustainable Travel International and author of a new book, Sustainable Cultural Tourism. She has also written other community planning books, including Planning for Balanced Development: A Guide for Native American and Rural Communities. You can learn more about sustainable cultural tourism and Dr. Guyette’s suggestions on value-based planning and development methods for cultural tourism by joining the seminar, Thursday, November 15th at 12:00pm EST. MACSers represent at the American Folklore Society annual meeting in New Orleans! The American Folklore Society held its annual meeting last week in New Orleans. And for the first time in AFS history, a panel of MACS students – led by MACS co-director, Amy Skillman – hosted a forum to discuss “Cultural Sustainability: Creating Leaders for Social Justice.” The forum was sponsored by the Politics, Folklore and Social Justice Section and was well attended by an enthusiastic and thoughtful group of folklorists. Attendees had the opportunity to learn about the MACS program and students’ applications of Cultural Sustainability theories and strategies through presentations by Michele Anderson, Michelle Banks, and Max Lannon. The panel also took the time to engage the forum attendees in discussions about Cultural Sustainability – as a field, strategy, and action – through a condensed version of an affinity mapping exercise, facilitated by yours truly (Sunny Fitzgerald). the reuse of old and defunct resources which still have value but which cannot survive alone. We have also plugged these responses into a word cloud (see photo above) that illustrates key terms that emerged from the activity and discussion. Many thanks to the forum attendees for their participation and interest in our program and the broader field, concepts, and strategies of Cultural Sustainability. We look forward to continuing the conversation and collaborating across fields more in the future. We are also looking forward to being joined by more MACSers at next year’s AFS meeting. The theme for the meeting has been announced; it will be “Cultural Sustainability”! To learn more about affinity mapping and the second MACS cohort’s experience with this activity in the Intro to Cultural Sustainability course with Dr. Rory Turner (in collaboration with Dr. Ross Peterson-Veatch), please visit this link. It is not difficult to find discouraging news regarding the state of indigenous and endangered languages, so I was happy to find this bit of good news in an article from Queen’s University in Kingston, Ontario. The University – located on Kanienkehaka territory and in close proximity to Tyendinaga Mohawk Territory – has begun offering courses in Mohawk and Inuktitut. The courses have received so much interest from students that both have already reached full enrollment capacity, with additional students waiting to get into the next available classes. To read more about Queen’s and their new Indigenous language course, check out the article here. The University of Utah recently announced it would be closing the doors on its Center for American Indian Languages (CAIL), in an effort to “restructure” and narrow it’s focus to the languages of Utah’s tribes. While the center’s mission has an intentionally broader reach – supporting initiatives for languages across the Americas – one of its most successful projects, the Shoshoni Project, is, in fact, focused on a native language of Utah. According to an article in the Salt Lake Tribune, the university says it plans to continue to support this project and move other efforts to the American West Center, yet never consulted CAIL’s principal faculty member on these changes. To read more about the closing of CAIL, check out the Salt Lake Tribune’s article. ʻAha Pūnana Leo, a non-profit educational organization operating Hawaiian “language nest” immersion schools (11 preschools on five islands, one infant and toddler program, and co-administering four charter, Hawaiian medium, K-12 sites on four islands), has received funding from the W.K. Kellogg Foundation to support a four-year project. The initiative will aim to create an accreditation process for Hawaiian Language Medium preschools, increase the academic rigor of the programs, and provide opportunities for teacher development and resources for families involved. Language nest schools have been the driving force behind Hawaii’s language revitalization movement. Thirty years ago, teaching the Hawaiian language was prohibited – by law – in public schools. When the ban was removed in 1986, less than 50 speakers under the age of 18 remained. Now, thanks in large part to ʻAha Pūnana Leo, that number has grown to almost 5,000. With the new project and support of the Kellogg Foundation, the Aloha state can continue to celebrate native culture and the growth of the Hawaiian language speaking community. To learn more, please visit ʻAha Pūnana Leo’s website. If you hop in Pan Ching-hsiung’s cab in the Greater Kaohsiung area of Taiwan, you may get more than a cab ride. Concerned for the fate of the native languages of Taiwan, Pan is handing out flyers and initiating discussions with passengers about the importance of perpetuating native languages. He believes the promotion of Mandarin by the former Chinese Nationalist Party (KMT) is partly to blame for the decrease in use of native languages. Beyond simply encouraging parents to speak their native tongue with their children, Pan is asking the Taiwanese Mother Language League to seek compensation from the KMT for the Mandarin-first policy that has led to native language decline. To read more, check out this article in the Taipei Times. And if you are interested in some indigenous music from Taiwan, check out Biung’s self-titled album “Biung.” Biung is a member of the Bunan tribe. I came across his album when discussing music with a young indigenous woman in Taipei. She told me that many of the younger generation were not listening to, singing, or playing traditional, indigenous music. Biung, already a popular musician, took some of the traditional songs and put them to “modern” beats and instruments. While some might argue that the songs done in this style are no longer “traditional,” the young woman told me that thanks to Biung, more younger people now know and sing these songs. Cultural Survival has teamed up with the Smithsonian Institution’s Recovering Voices Initiative to host a conference in support of Indigenous radio and endangered language revitalization. The conference, “Our Voices on the Air: Reaching New Audiences Through Indigenous Radio,” will provide an opportunity for Indigenous radio producers from several countries – including Canada, Colombia, El Salvador, Guatemala, Mexico, New Zealand, Peru and the United States – to come together with media professionals to share their experiences, ideas, and knowledge. Some of the materials and ideas that emerge will be used by Cultural Survival to create a national radio series that will serve to shed light on the story of endangered languages worldwide, and the significance of Indigenous radio in the efforts to revitalize these languages. The conference is being held July 31- August 2, 2012, at the National Museum of Natural History. For more information and a detailed schedule of conference events, please visit Cultural Survival’s website. Inmates at The Women’s Community Correctional Center (WCCC) in Hawaii are assisting in efforts to sustain an important piece of Hawaiian history. As part of “Ike Ku’oko’a”, a Hawaiian Newspaper Initiative, Hawaiian language newspapers from 1834 – 1948 are being transcribed and entered into a database. Inmates have the opportunity to reconnect with their roots while working on the project. Project supporters believe that in reconnecting to the Hawaiian culture and history, there is a chance for these women to heal from past traumas and build a more positive future. To find out more about the Hawaiian Newspaper Initiative, check out this Hawaii Reporter article. For those interested in volunteering, you may contact Awaiaulu Director Puakea Nogelmeier or Project Manager Kaui Sai-Dudoit at (808) 845-8918. No Hawaiian language skills are required.